VisioDAML is a Visio application to illustrate how Visio can be used to create graphical representations of DAML+OIL ontologies. 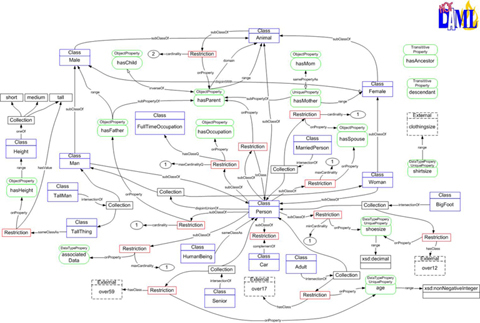 This implementation is intended to provide, as close as possible, a direct one-to-one mapping between the DAML+OIL language constructs and their graphical representation. You can find the Word document version of this page here. Please contact John Flynn with any comments or questions about VisioDAML or Webmaster with comments or questions about this page. VisioDAML consists of a Visio template, stencil and an example drawing. The Visio stencil contains shapes that represent the DAML+OIL language contructs. The Visio stencil is titled "Ontology" and it looks like the figure below. You can apply any one of the DAML+OIL language contructs by clicking on it and holding down the left mouse button while draging it onto the drawing page. 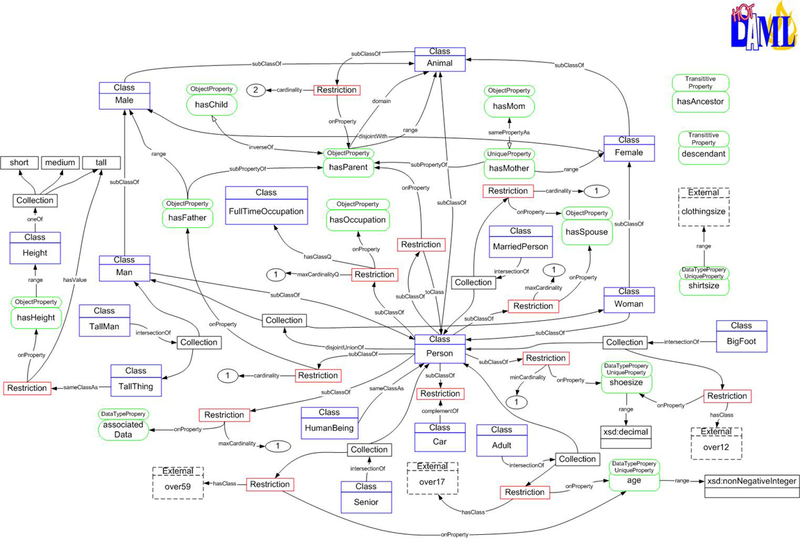 An example drawing showing the base ontology used in the Annotated DAML+OIL (March 2001) Ontology Markup is show below. Click on the above image for the full view. When you wish to create a new ontology drawing using VisioDAML, select File, New, Drawing Type, Ontology Template. That will bring up the Ontology stencil and a blank drawing page. When you use a connector that represents a language construct, such as "subClassOf" to connect two boxes that represent language constructs, such as "Class", drag the end of the connector into each box until the outline of the box turns red. That ensures that the connection is permanent so that the connections will not break if you drag the boxes to new locations on the drawing. After you have completed creating your new ontology, select Save and you will be prompted to name the ontology drawing file. specifically states that the class Female is disjointWith the class Male. So, the white arrowhead should connect to Female and the black arrowhead should connect to Male. This allows the viewer to visualize with which class the connector was declared. Download the Visio Ontology Template, Stencil and example drawing that matches the version of Visio you are running. You can place the files in the appropriate Visio folder for your version, which is normally C\Program Files\Visio\Solutions\Ontologies. Add constraints to DAML+OIL language contruct representations (stencil shapes) to allow only syntactically legal connections. An error message should appear when an attempt is made to connect construct representations in illegal ways. Link text popup windows showing the actual DAML+OIL markup that corresponds to each graphical element of an ontology drawing. Use Visio layers to create multiple instances of an ontology. Visio supports the development of Visio Solutions that are relatively complex applications linking Visual Basic and/or C++ code to graphic elements. This may provide a means to generate DAML+OIL ontologies directly from the Visio graphical representations. Read in DAML+OIL ontologies and automatically create the Visio graphical representation. If you do not have a copy of Microsoft Visio you can still view Visio drawing by using the free Visio Viewer that can be downloaded from http://office.microsoft.com/downloads/2002/VWC10.aspx.